You may celebrate Friendsgiving for a number of reasons. Maybe you live too far away from family and don’t have the time or money to travel this year. Maybe you just have a great group of friends who are worth the effort of having a separate Thanksgiving meal. 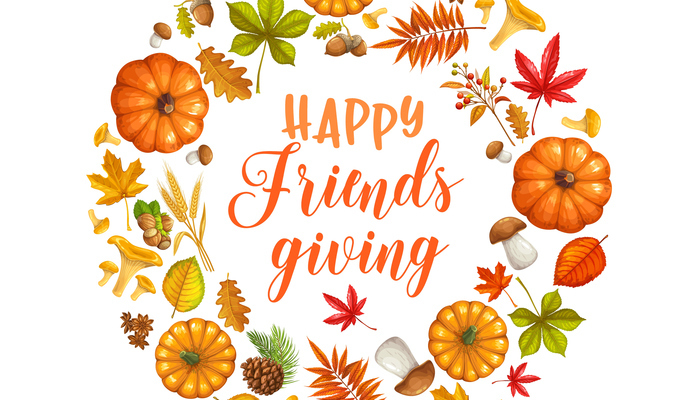 No matter the reason for having a Friendsgiving, it’s a great way to celebrate the holiday season with food, friends, and laughter. If you’ve never hosted a large dinner party it may be intimidating to think about cooking, decorating, and entertaining a big group of friends, but with these tips you’re guaranteed to have a day you and your friends will be talking about long after the holiday season. Food is arguably the most important part of the holiday, whether it be a more traditional Thanksgiving or a Friendsgiving meal. No matter what your level of cooking skill you can make a delicious meal that is sure to satisfy your friend group. 1. Potluck – Share the wealth a little and have each of your guests bring a side or dessert while you provide the turkey. Make sure to have a sign up of some sort, though, or you’ll end up with 5 types of mashed potatoes and no veggies! 2. Slow Cooker – If you’re feeling a bit ambitious and want to cook the food yourself, give yourself a bit of a break and use a “set it and forget it” method of cooking. A quick online search will give you recipes for tons of dishes like green bean casserole, mac and cheese, and even a whole turkey. 3. Leftovers – Send your guests home with some food! Get some take home containers and keep your friends fed for days after Friendsgiving and keep the food waste down at the same time. Don’t forget to keep your friends hydrated during your Friendsgiving party! Depending on your guests and how generous you’re feeling, you can ask each to bring a bottle of wine or provide cocktails or mocktails for everyone. 1. DIY – With just a little prep on your part you can easily have a sangria or mimosa bar. Use fruit juice (sparkling or not) for a nonalcoholic option. 2. Batch - You can’t go wrong with a slow cooker full of warm spiced drinks for your guests to serve themselves all evening. A delicious nonalcoholic option is a classic Wassail, or try this spiced wine for an adult beverage. 3. Signature Drink – If you really want to wow your friends pick one or two signature drinks you can make for everyone throughout the night. Try this pumpkin pie martini or a pomegranate blueberry mocktail. While the food and the drinks are the stars of Friendsgiving, make sure you have some sort of activities to keep your guests entertained. 1. Old school – Keep everyone off their electronic devices and enjoying the moment with board games and a couple decks of cards. If you have a big group have stations set up so groups can branch off into whichever game they want. 2. Holiday-themed – Remind everyone why they came with Thanksgiving themed activities like this printable thankful bingo. You can also use craft paper for a table cover and set out crayons and markers, or buy this Thanksgiving set to encourage creativity. 3. Sharable fun – If your guests are more online and socially minded, set up a photobooth and encourage pictures throughout the night. If you’re feeling extra tech savvy you can even decide on a hashtag for everyone to use or set up a geofilter for Snapchat. Show us your Friendsgiving celebrations on Facebook and Instagram! Especially if you host or use one of these ideas tag us so we can check it out!